I really enjoy drawing and painting crows. I have a few pieces I’ve done in a variety of mediums over the years, and a bit of a project planned for the future. 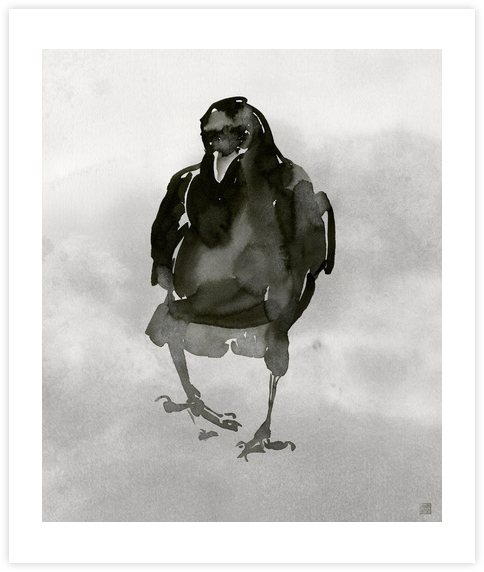 Currently, I am giving society6 a try with a print of one of my crow drawings (the original is india ink on paper). I’ve toyed with the idea of prints for a while, but it’s just not cost effective for me to go get them printed – and frankly, I’d prefer to channel my time into work, not into printing, packing and shipping. It’s pretty cool that there are now a lot of choice with print on demand outfits that handle the fulfilment. I’d recommend the smallest size – it’s closer to the original size of the work. Some more crows (not as prints) – watercolour crow, unfinished crow oil painting, willow charcoal on vellum crow.